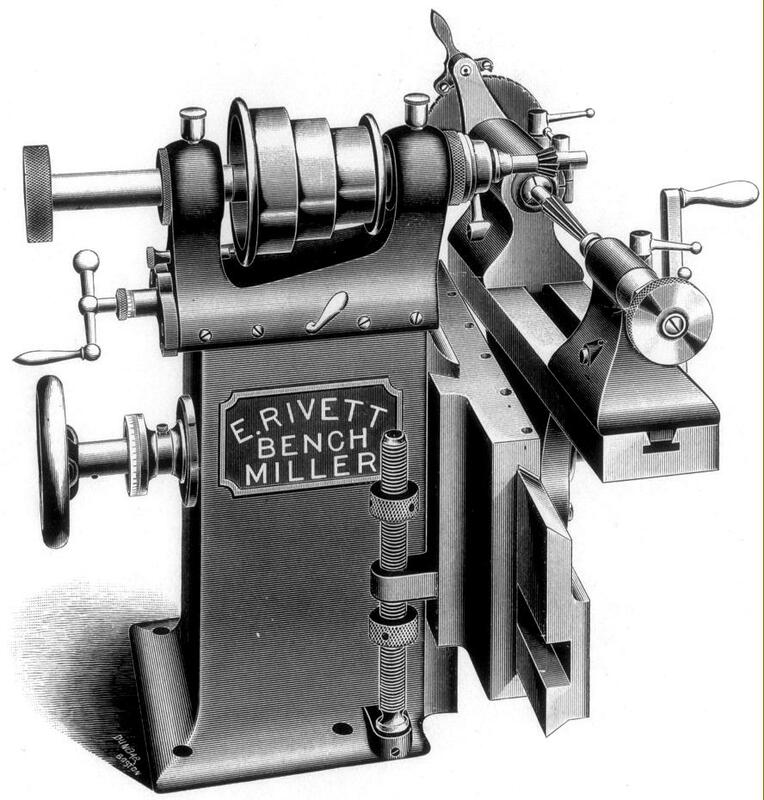 Arranged on lines not dissimilar to those employed by many other makers of small precision machine tools, the Rivett bench milling machine was manufactured during the late 19th and early 20th centuries. 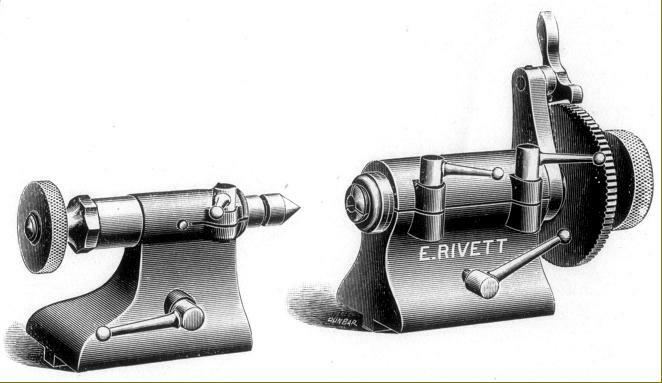 It was, like all Rivett products, not only superbly made and sold at a premium price, but also featured an unusual arrangement of a swivelling table. 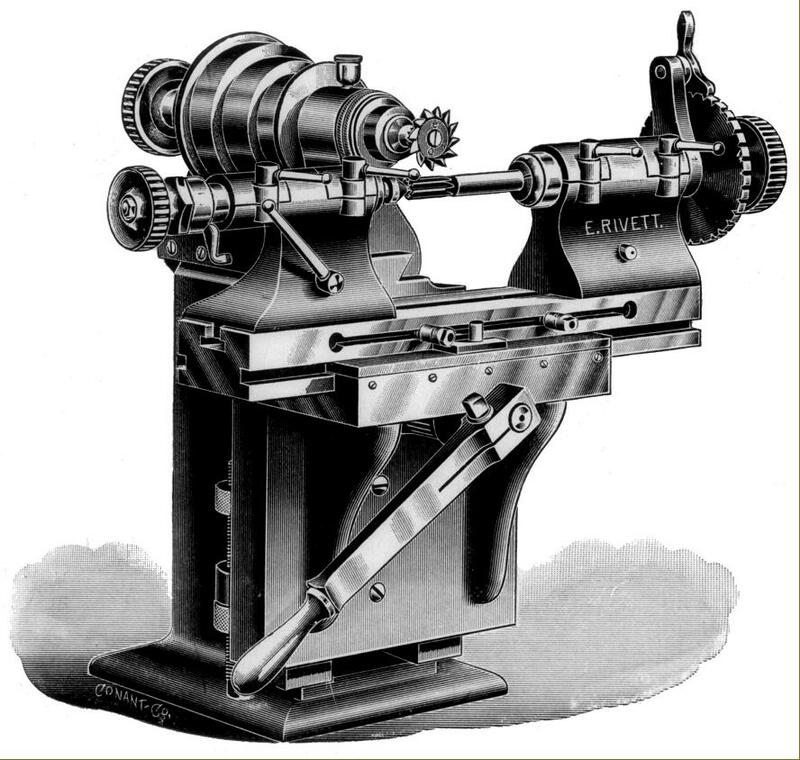 Although most other makers offered their customers a choice of table feed by screw, lever - or both - on the Rivett it was exclusively by lever feed, the makers claiming, with some truth, that, "….. we do not put a screw feed on this machine. 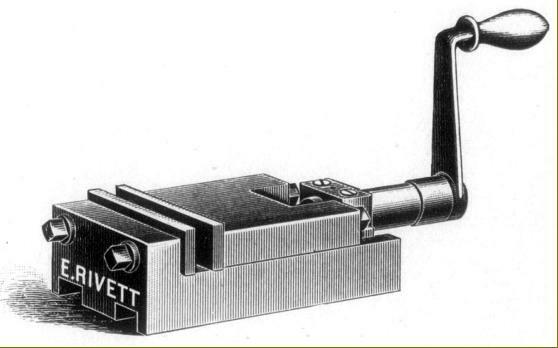 Experience tells us that the "FEEL" of a cut can be more readily detected though a lever than by a screw. 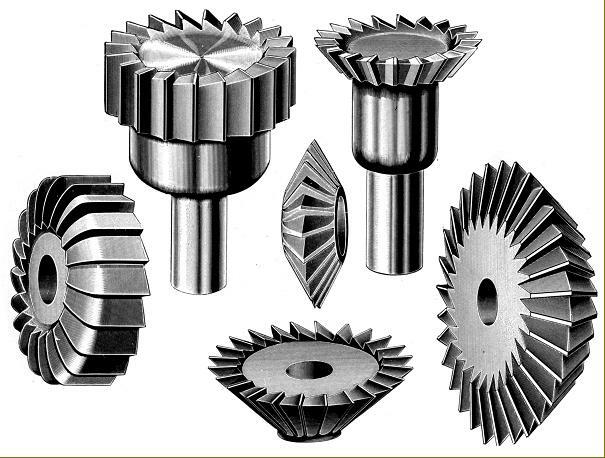 We have these machines in our shop, cutting with saws 3/1000 inch in thickness and we have found it impracticable to use a screw feed on such work." 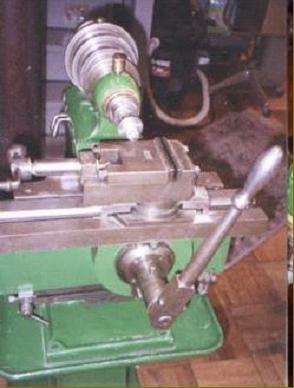 However, the in and out movement of the head - and on some versions the elevation of the knee, did use a screw feed. 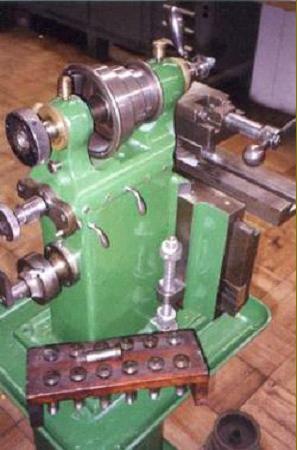 Available in both "Plain" and "Backgeared" versions, the latter version (mounted on a more substantial base) had an arrangement of gears around the drive pulley not dissimilar to those provided on a backgeared lathe. The head (virtually identical to that on the Company's No. 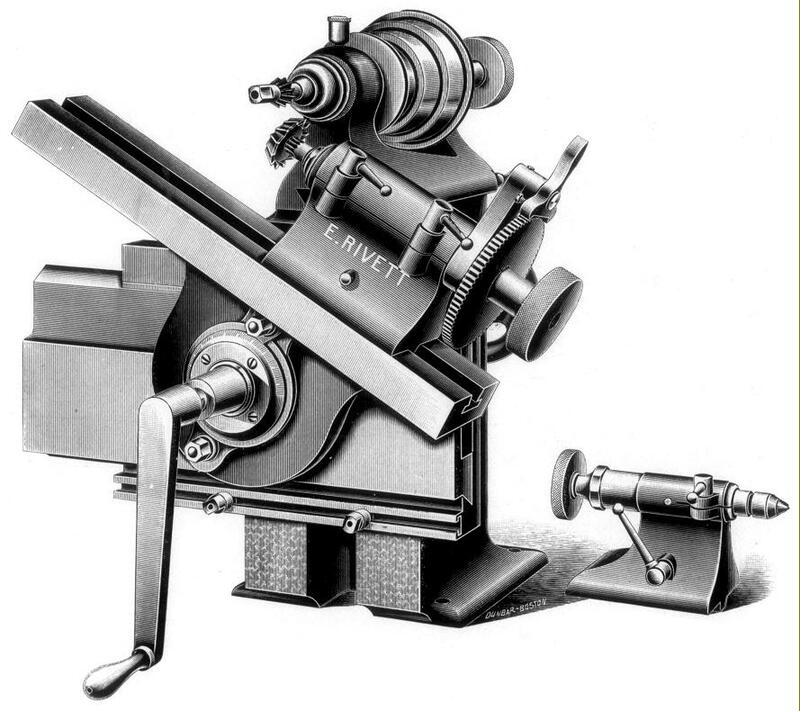 4 lathe) could be moved in and out by a screw, whose handle and graduated dial faced to the rear; although the travel of the head cannot have been large, no indication can be found of how the belt-drive mechanism was arranged to compensate for this - though possible some sort of sliding pulley running along a keyed shaft would have been used..
Fastened to the main horizontal slide the rack feed of the tilting table was and arranged to pass through its mounting flange while a shaft, which passed through the body of the miller from the rear, turned a pair of bevel gears, one of which surrounded a vertical screw which lifted and lowered the knee. 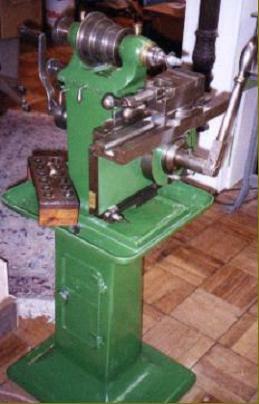 On plain versions the knee feed appears to have been operated by a handwheel, while backgeared-equipped machines were equipped with a long handle. 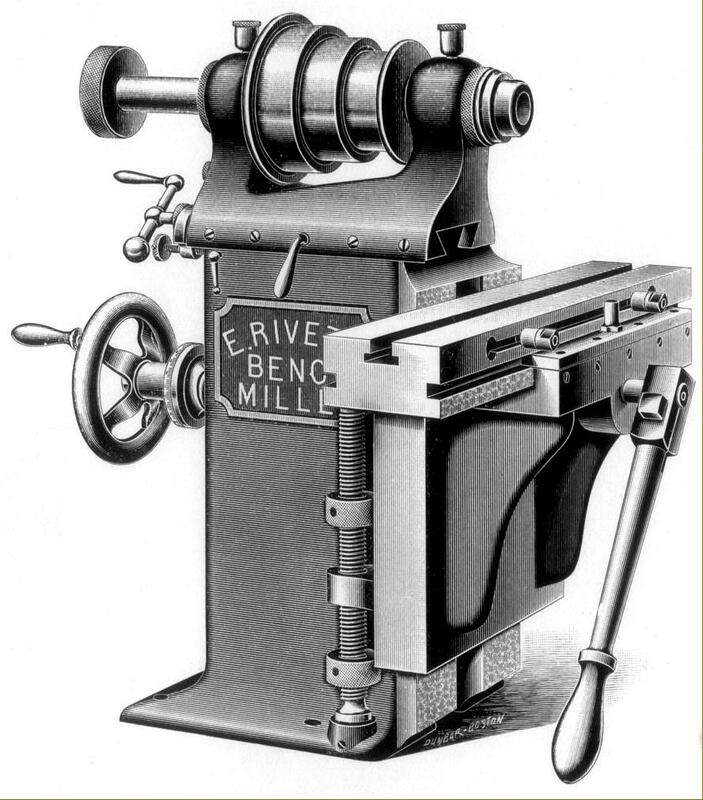 Accessories provided for the bench milling machines consisted of collets, an indexing head with interchangeable plates and a tailstock and a plain machine vice. 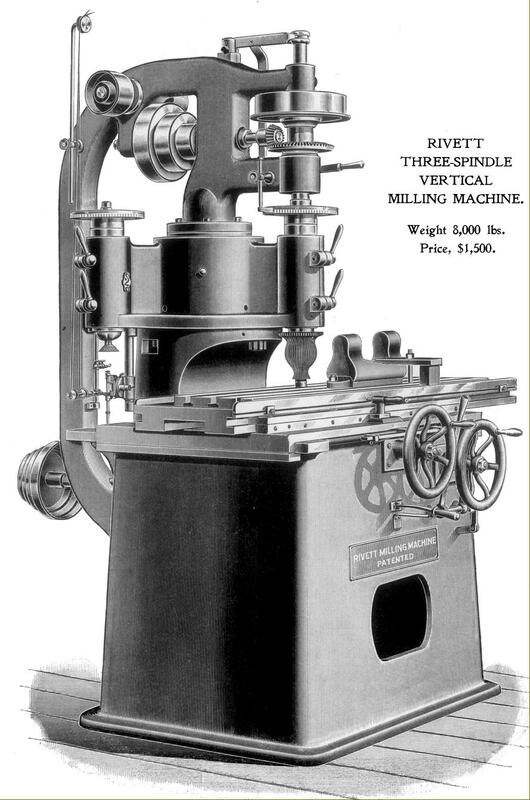 Rivett also manufactured, in the same era, a large, 3.5-ton three-spindle vertical milling machine - of which non appear to have survived. 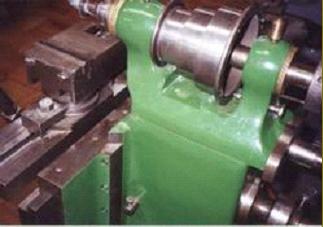 Mounted on a rotating boss that formed the lower part of the vertical column assembly, the three heads could be indexed in turn to the front working position..